I've been hard on myself the past few days, if you haven't noticed. 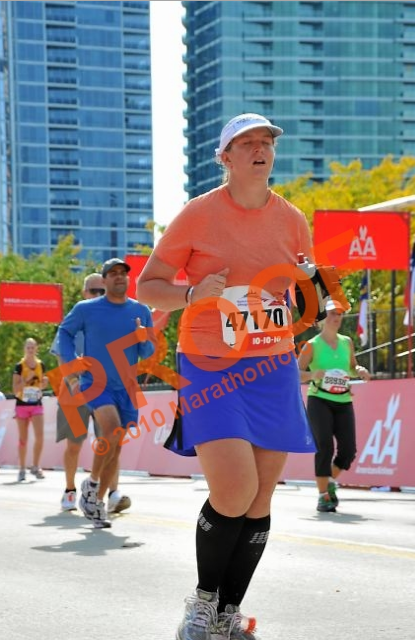 When you're as slow as I am and you have a bad race, it's sometimes hard to discern the difference between "acceptably slow" and "I'm better than this slow." 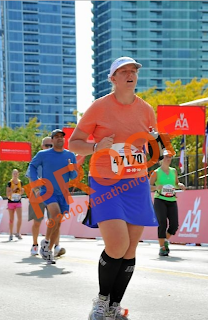 But now, thanks to the magic of Marathon Foto, I have an objective look at my race and I can officially put Sunday's race into the "I'm better than this" category. Care to take a scenic walk through the streets of Chicago with me? Because it's a walk I'm taking in these photos, get it? You can do it, Tracy! Smile for the cameras! What a great race you're having! 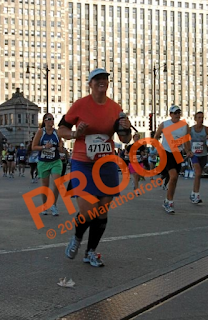 It's totally natural to have your right hand balled up into a fist - that's perfect running form and in no way indicative of physical discomfort! Uh-oh. What is that look of consternation on your face? This does not look good for Tracy. 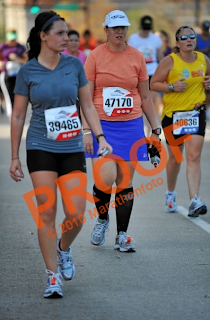 I'm biting my lip in pain here. Also, I'm walking. In case you couldn't tell. Okay, and we're running again. Totally running. Just with a vapid, empty look on my face. Like no one's home. Completely normal. At least there's shade. 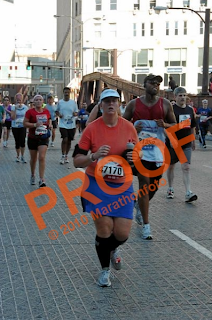 I really hate people who can a) rock booty shorts and make it work, and b) look near the finish of a marathon as though they've exerted no effort. I am neither of those people. Instead, I look like death. Mile 26. I'm thinking about quitting. 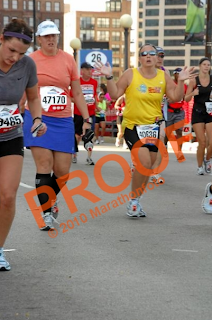 I love how the woman next to me is all jazz hands/pained expression here. I also love how this photo is like a minute after the other one, but my expression hasn't changed at all. Actually, my shoulders might look slightly less slumped in this photo. Nope... I take that back. Shoulders are still slumped. 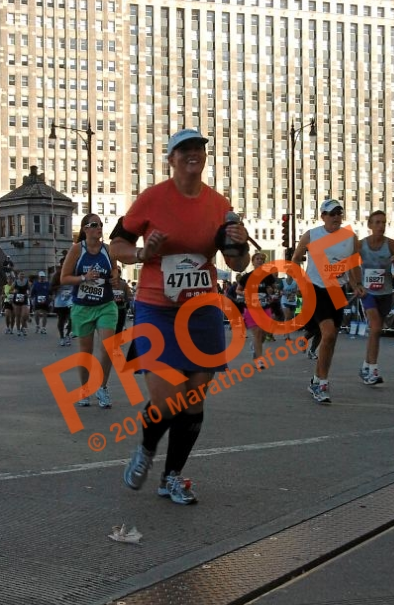 This is on Roosevelt Road, less than 400m from the finish. I saw the 400m sign, thought, "Huh. In an ordinary day, you could do that in like 2 minutes," and I just kept shuffling. I CLIMBED MOUNT WASHINGTON AND A FREAKING RAILWAY OVERPASS REDUCES ME TO THIS? This is the finish. 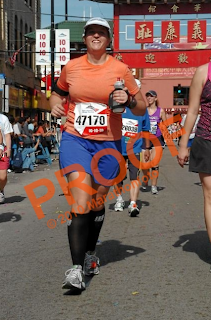 My eyes are closed - not a fluke of photography. I wanted to die. I am shuffling. Take home message: sometimes you feel like you're having a bad day, and it's because you're actually having a bad day. Sorry...I can see you are in pain, but your comment with the photos...I'm laughing out loud here! You're hilarious! 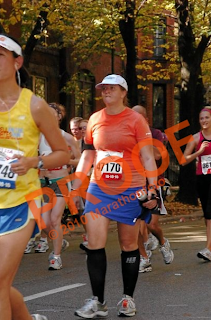 Considering the knee injurieS (yep, that's right BOTH knees), I'll try to match these photos after the NY Marathon. That is ofcourse if I finish that thing at all. Your pictures are hilarious. 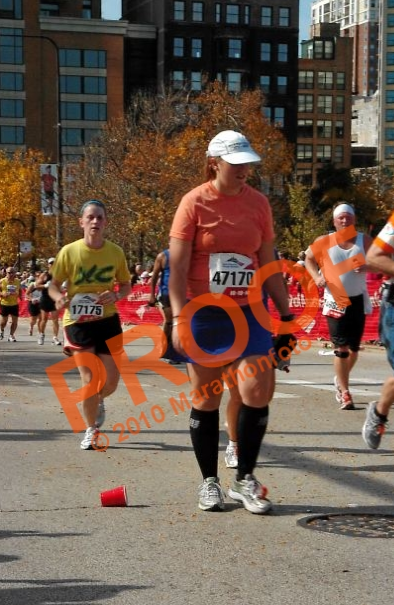 I know, I can feel your pain, but you have the best facial expressions that actually shows how much pain you're in. total jazz hands- who does she think she is anyway! Girl, you're commentary is hilarious, but your face in the pix isn't. That was a brutal day. Rest, and get ready for your race of a lifetime! Go, Tracy, go. Are you going to order any?